Spearfishing floatlines in 25ft., 50ft., and 75' lengths. These sturdy lines are made from 550 lb. Tuna Line with stainless steel longline clips. The tubing is much smaller than competitors, which makes it less bulky to tote around. Includes 600 lb. stainless steel shackle on one end to allow attachment options to your float or gun. One end connects to your float while the other connects to your speargun. 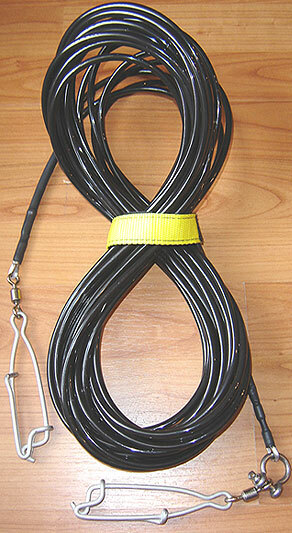 Pay far less for your float line here. Comes in black with velcro strap for storage.